A blog from Precision Envelope, featuring advice on direct mail marketing, digital marketing, custom envelopes and fun content, all geared towards a small business audience! 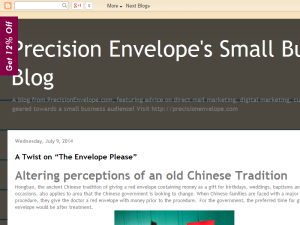 This what your Precision Envelope's Small Business Blog Blog Ad will look like to visitors! Of course you will want to use keywords and ad targeting to get the most out of your ad campaign! So purchase an ad space today before there all gone! Will Pantone's Color of the Year Change Your Promotional Mailings & Marketing? If you are the owner of Precision Envelope's Small Business Blog, or someone who enjoys this blog why not upgrade it to a Featured Listing or Permanent Listing?